In Part 1 of this series, my passion for linguistics ignited, and I drove myself to invent a language for each of the five races in my fantasy novels. The merfolk are the oldest race, so it made sense to start my five related languages with Meri. For each of my languages, I envisioned a fatal flaw, something that defied linguistic principles in a subtle yet pervasive way. I wanted the languages to feel realistic while still harboring a clandestine weirdness that only my fellow linguists would discern. For Dyau, I omitted all nasal sounds, though there is an /m/ or /n/ sound in every single human language. For the daemon language, I omitted all vowels and voiced consonants. For Meri, I did the exact opposite and omitted all voiceless consonants. It occurred to me that a language spoken underwater would need to be completely voiced. Try to hum underwater, and you'll find that others can hear the voiced sound. But if you whisper, there are only voiceless bubbles that no one can distinguish. Of course, the merfolk wouldn't be using air to transmit their speech, but I still decided that voiceless sounds like /t/ and /sh/ wouldn't be included in Meri. That's when some trouble started. Going through my characters and place-names, I realized that the Meri language already included three voiceless letters. Names like Dynde worked fine, but names like Rovikya, Sonne, and Dohar defied my new rule against voiceless sounds. But instead of renaming everything, I recalled how Star Trek's linguist Marc Okrand developed Klingon and Vulcan out of nonsense gibberish. Inspired to salvage my Tales of the Known World saga, I decided that Meri's /h/ wasn't a consonant at all. Much like the silent /e/ at the end of many English words, I used the /h/ in Meri to change the way a syllable's vowel was pronounced. That left /k/ and /s/ for me to iron out, and I decided to employ them as special sonar clicks rather than traditional consonants. Dolphins use sonar clicks to communicate underwater, so why wouldn't a sentient underwater race have a few sonar clicks as consonants? 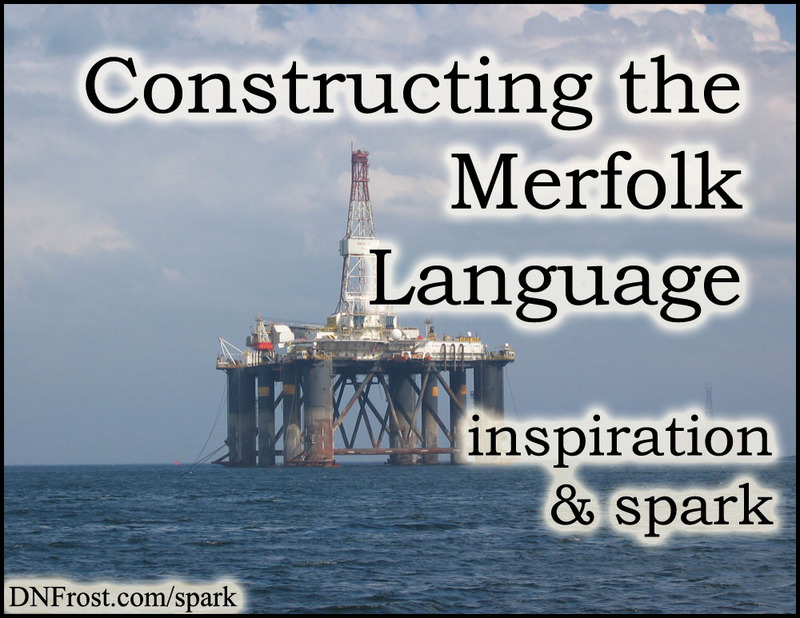 With the rules of Meri outlined, I wrote a long creation myth for the merfolk and set about translating it into the language. Though I didn't finish my translation, I did develop the first page or two into a sample of the Meri script. I didn't have Photoshop then, so I spent arduous hours in MS Paint, carefully lining up letters to create my script samples. With so much work in front of me, I decided that what I had of the merfolk myth was sufficient as a sample, and I moved on to the other languages that needed fleshing out.